Despite almost ruining Samsung's reputation beyond repair, the Samsung Galaxy Note 7 is making a comeback, and a new teardown shows exactly what's different this time around. To increase safety and avoid another recall, the limited-run Samsung Galaxy Note Fan Edition has a battery that's undergone some major changes, according to an iFixit teardown. The South Korea-exclusive Fan Edition features a brand-new, lower-capacity battery that holds 3,200mAh of juice, down from the original Note 7's 3,500mAh. However, it's not just smaller energy storage that's meant to prevent the Fan Edition from overheating, but also a smaller form factor. Though we've known for a while the Fan Edition would sport a lower-capacity battery, iFixit's teardown finds the new battery is also physically smaller, both in mass and dimension. This is likely because one of the original Note 7's biggest flaws was that the batteries were incorrectly sized, making them prone to swelling, punctures and, ultimately, catching fire. While by no means a massive downgrade, (Apple is hush-hush about exact specifications, but the competing iPhone 7 Plus reportedly has just 2,900mAh of battery life) the reduced juice and size on the Galaxy Note 7 Fan Edition's battery should help it avoid meeting the same self-immolating fate of its predecessor. 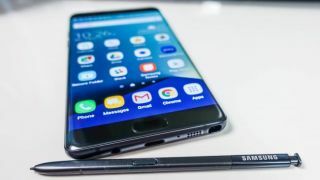 Samsung may be bringing back the Note 7 in a small way, but all eyes are already on its next big release, the Samsung Galaxy Note 8. With a launch tipped for August 23, the Note 8 may help Samsung put the whole Note 7 fiasco behind it, once and for all.